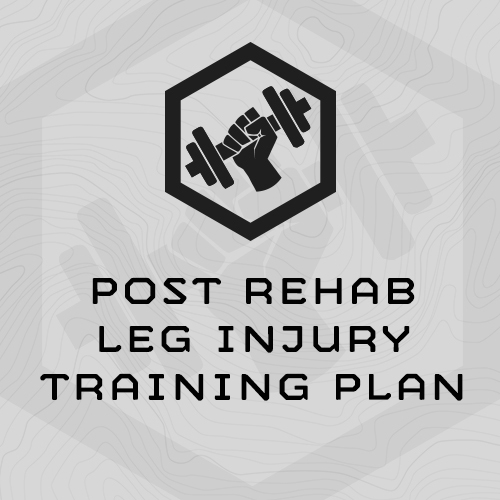 This training plan is designed to help athletes who have suffered a leg injury, and subsequent surgery, to bridge the gap between the end of physical therapy and the beginning of full on training. This is a 6-week long, 5 day/week training plan for 30 total training sessions. This is not a rehab plan. Rather is it a progressive training plan which deploys strength training and low-level plyometrics with the goal of strengthening weak legs coming back from surgery and physical therapy. This plan is designed for athletes who have completed physical therapy and been given clearence from their physician for unrestricted physical training and activity. You should have normal ranges of joint extension and flexion. I went through the post rehab leg injury training program. I've the confidence I had lost after my injury and am back to where I was at before the injury. Thanks a lot for your program. I am about to complete your post rehab leg injury plan and was wondering what program you would suggest following next. I loved the program and it made a huge difference getting me back up to speed after being released from physical therapy (knee surgery). I started front squatting with 0 weight and was working with 165# in my last session – still have work to do but I’m lightyears ahead of where I thought I would be in such a short time. Just wanted to drop some kudos your way for your Post Rehab Leg Injury Plan. I picked up 2 ligament ruptures in UK Army Officer training, and then managed to suffer a minor ankle fracture whilst in rehab. After a medical discharge from training I was able to walk, I set about training for a marathon- although completing the marathon I did my leg no favours. I ran through the post rehab plan, having to re-do some weeks, but after I am now able to run properly again without increasing the pain in my joint. I can undertake DLs, squats and more importantly can now train at a capacity and intensity that will guide me towards attaining the standard where I can have another crack at Officer training- I believe that this is due to your programming, so much kudos for that.